A friend of mine posted a photo of her menemen for breakfast at the weekend, and I showed Berkay – he licked his lips and said how much he missed it, so he cooked it for our dinner Saturday night. 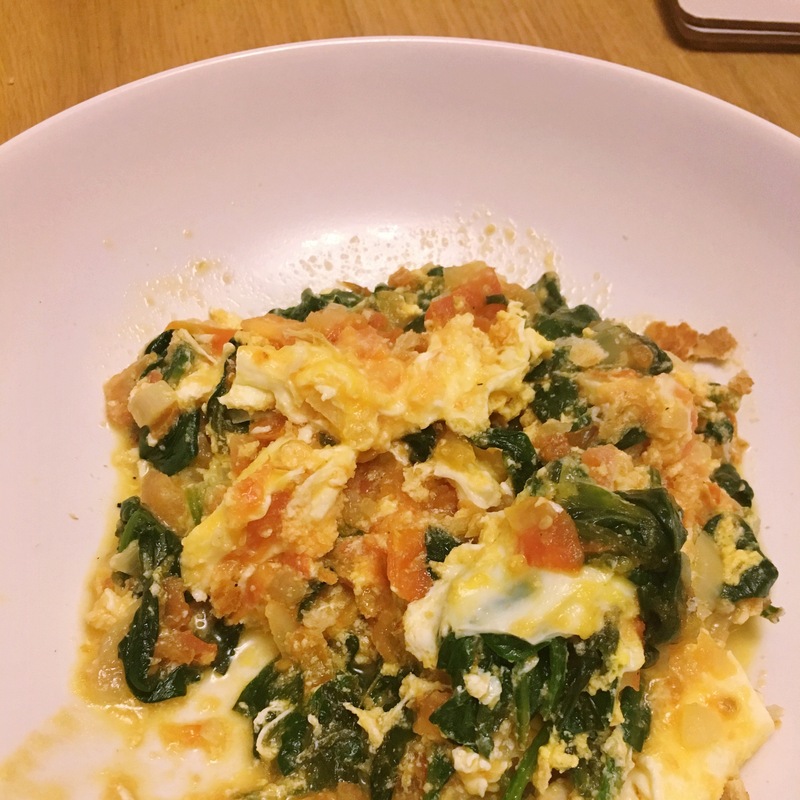 Turkish menemen is the easiest dish to make ever, and a good way to use up whatever you have left in the fridge, especially squishy tomatoes! It’s so simple but so tasty, and you’ll have to trust me when I say it tastes much better than it looks in my photos. – chilli flakes, spinach, anything else you fancy, I’ve even seen some people crumble some feta cheese on top. First, heat the oil/butter in a pan and add the chopped onion and pepper. Berkay didn’t actually use pepper this time as we didn’t have any – they don’t usually sell the long, thin peppers in supermarkets but you can get them from international food shops. We walked past an Asian greengrocer stall and saw lots on there but didn’t think to get any – we’ll have to visit the local Turkish food store and stock up. You could try and use a normal bell pepper but I’m not sure how well it would work. Next, add the tomatoes. Usually, we peel the tomatoes and chop them but you don’t have to. Berkay left the skins on this time, chopped them small and made sure all the juices were in the pan. For a bit more flavour, you could use a tin of chopped tomatoes and they’d be much juicier. Berkay says the tomatoes here are just not the same as Turkey and I agree with him – another thing to stock up on at the local Turkish food store next time! 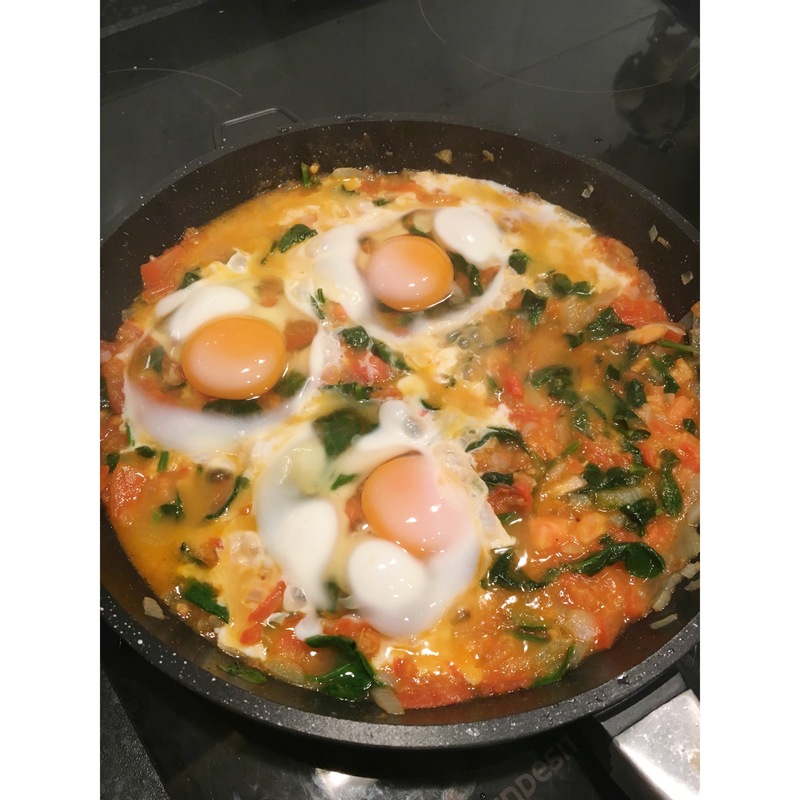 We added spinach at this point just because I really like it, but it’s not usually a key ingredient of menemen! Let the pan simmer for a couple of minutes, you want all the onion, pepper and tomatoes to be soft and plenty of juices to be in the pan. Then, make little pockets in the mixture and crack your eggs into them. You can leave them whole, or mix them in so it’s more like scrambled eggs – it definitely looks more appetising when you leave them whole, but they cook more evenly when you scramble them in. Once you’ve added the eggs, add your salt, pepper and/or chilli flakes and cover the pan with a lid. Leave it to simmer for another 1-2 minutes, depending on how runny you like your eggs to be. Usually, menmen is served in a special silver pan, along with some fresh, crusty bread or a seedy simit. Delicious, simple, filling and cheap! Special thanks goes to Maxine for posting the photo of her food that inspired us to make it. Poor Berkay really struggles with the food here and adjusting to the different portion sizes and more convenience style food, he especially finds it hard not eating a whole loaf of bread with his dinner like back in Turkey, so he’s always excited when he sees photos of Turkish food and I often find him salivating staring at the photos on his phone! Please, trust me when I say it tastes better than it looks! I love menemen! It’s one of my favourite dishes. My grandmother sometimes used to add ground beef to it. So yummy.